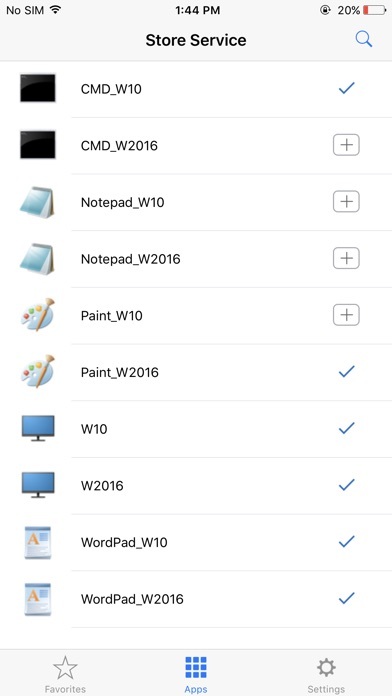 Once the app updated to Workspace it no longer connects to the Server. Found that a server certificate is now manually required to be attached in iOS, MacOS, and Windoze. End users are not familiar with this procedure. My remote connection using my iPad worked flawlessly until this most recent update. Now it wont connect at all. I’ve tried to reinstall my account but it still doesn’t work. How do I get my old version back!!?? 18.9.0 still doesn’t recognize a valid certificate on iOS 12. And if you bypass the certificate warning, the login spins forever. Sad that Citrix broke the app just to change the name. Recent update corrected bug that prevented cellular connection. Receiver worked well. Workspace has problems getting connected and frequently drops the connection. Way to many bugs - shouldn’t have been released. Can't log in at all. Completely useless. Can’t get it to connect on cellular even though I have that option set. Only connects on Wi-Fi and even though occasionally get an error. I love the app as it lets me work from home when needed. Just seems to have difficulty with the keyboard function on an iPad. It hits 1 key multiple times if you type at a normal speed, have to slow type which can be annoying. Otherwise I truly love this app. Can’t sign in. Everyone around me with iOS 11.x can. C’mon, you guys. You had loads of time to prep for this. So much less glitchy since the recent update. App runs great. The user experience is getting better. With this upgrade (from Citrix Receiver) everything works like it did before but faster, smoother, and more polished. This app is pretty good. I am using it on an iPad which has its limitations anyways but overall the app does what I need it to and helps me get my day to day work done. This entire paradigm is unstable, slow and unreliable and impressively they still made it worse. It used to fail about 5 minutes into a session, now I can’t sign in. I know the world is a complex place but how is it possible to release a new iteration of software so glaringly defective? They make ATT wireless look like Apple. STAY AWAY. I’ve found that the applications I run through Citrix Receiver on iPad regularly become unresponsive, or close all together, causing me to need to shutdown and restart everything , which obviously is a big headache and not conducive to getting work done. I don’t have this issue running Receiver on other platforms, so it seems to be specific to the iPad app. It is in need of significant improvements before running Citrix Receiver on iPad could ever be considered as a laptop replacement (as some of Citrix’s marketing blogposts have suggested). It allows me to get some work done before running into problems, and thus although it is somewhat functional, it is very much a subpar experience at this point. The app no longer lets me log into work email since it was updated. 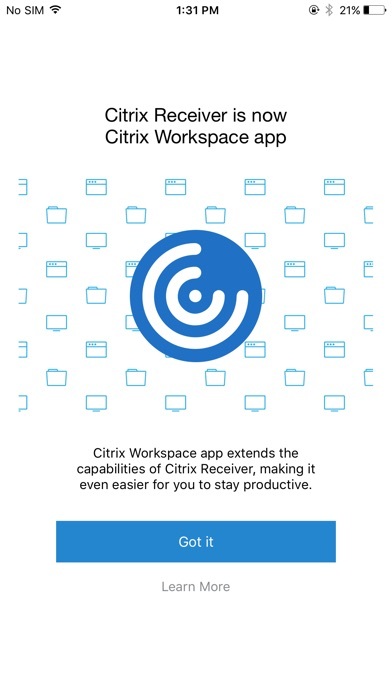 Citrix Workspace acts no differently than Citrix receiver for our company’s uses. The app we require is useless on a smartphone, and only marginally navigable on a tablet. Access to highly important, time sensitive information takes WAY too long to navigate to. 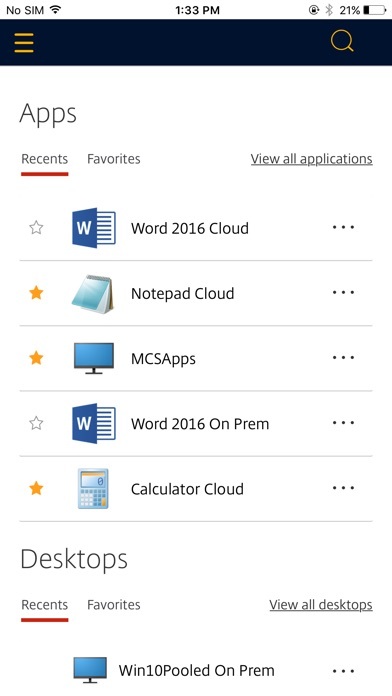 I have much better luck using a different VNC app into my office computer to access the required app within citrix. The full screen view loses itself when a device is rotated and shrinks down to a postage stamp. If the full screen view returns, the same issue happens again upon rotation. Pinch to zoom is buggy, the VM lags like a 75mhz NEC running Win95, and good luck opening most attachments on iOS... Another place where a regular VNC app excels, as I can open attachments on my actual computer for viewing on my smartphone. Trying to add data or attachments to our chosen app is not even possible on this mobile platform. This company is getting worse and worse. Save your money. Use something other than Citrix. Good lord thank goodness for this!! Now I can finally edit and work on Microsoft office with a mouse! Fast reliable connect for work! The window is small and doesn’t utilize the whole ipad screen, impossible to work on. The app is horrible and is rigged to inflate reviews. Inside the app, it asks you to rate it and only sends your rating to the App Store for a 4 or 5 star review. Thanks for providing a great tool for working remote to Microsoft OS to iOS iPad. The Cetrix app is new to me and so far it’s been very convenient for what I use it for! I’ve had so many problems with this app. I’m always on the phone with tech support from the hospitals and ultimately have to always reinstall this app in order to access patient charts. It’s awful! I log in and then it crashes in the midst of my charting. I have to sign back in then it does the same. Just completely closes. Aggravating. It looks and works just like the desktop. It’s not really formatted for small touch screens. Constantly having to zoom in and out. Buttons and links are so close, anyone with big fingers (like me) keeps hitting the wrong buttons (regardless of zooming in). It’s great App, but one more opportunity for improvement to make it perfect; is to sign in from iPhone with fingerprint rather than writing our login info. Thanks. The app keeps kicking me out in the middle of working!!! IT has no clue and wont help because its on a personal device. Update : 6/29/18 I have been having freezing issues and kick out issues with this app for over 6 mos, still no resolution on either end. Nice app. Agree with another that there are some tough edges. But it is a big improvement from my perspective. Avoid crashes in Epic by: Turning off these settings off in Citrix... Http proxy Fullscreen Window Use Native Combo box Would be nice to have a Receiver instruction manual. Would be nice if Epic didn’t log out when iPad cover is closed. It sporadically and intrusively asks me to rate it, even though I have this option turned off in ios. When it does this I lose my session and have to restart it from the web browser. So here is your review. It's a good platform to use if I want to use iPad (instead of a laptop) to view my company's Virtual Desktop Interface (VDI), and it's nice to access my department's scheduling software FOS. Responsiveness is much better than my original 3-Star review. A few new observations: works well with iPad Pro with an Apple Pencil, view can be distorted when rotating iPad from Portrait to Landscape. Works great, but we completely screw up my login which took many steps every time it offered me to rate the app. If it wasn’t for that being so annoying I would give it five stars. The fact I have to re-login and give a review to make it stop is ridiculous. Got the mouse, logging in to the VDI Remote Desktop, but the following to issues render the app useless: 1) The X1 mouse pointer does not coincide with the cursor’s action. In other words, the actual, invisible pointer is some distance down and to the left. 2) VDI screen does not scale properly. Only about 2/3rds of the screen are utilized - the rest is black empty space. Anyone else experiencing these issues? It allows me to pop on whenever I want but if I am not constantly active in the app it disconnects. I wish it would not disconnect so fast. In a pinch, I use my iPad to access our citrix windows desktop environment. My iPad has a Bluetooth keyboard/case. I cannot delete anything or open the start menu with a keyboard key. I constantly use shortcuts (win+x followed by letter for command) and this greatly hinders my productivity. I’ve tried searching online and someone in 2010 brought up this same situation and from what it seems, nothing has been done to even address it. Does not work well with an iPad Pro. If you do not have the keyboard connected, the iPad screen keyboard will not activate so that you can type. If you connect the Pro keyboard after the app is open it does not work - you have to reboot the app. When using for Epic (electronic health record) the app crashes when signing point of care forms and orders so frequently that it’s unusable. I’ve had so many problems with this app. I’m always on the phone with tech support from the hospitals and ultimately have to always reinstall this app in order to access patient charts. It’s awful! This app is a surprisingly quick way to gain remote access to my work applications. Quicker than accessing it via a laptop or desktop. It also scales nicely to the high resolution of my iPad Pro - see more of the screen without scrolling unlike my laptop. Generally works very well and there have been some nice enhancements over the years. This program works pretty well, I’m able to access my company’s Quickbooks from anywhere. You can tell there is still room for improvement, but overall, it’s functional. As technology improves, I’m sure it will continue to work smoother and faster. This app is horribly bugged and dysfunctional. The ratings are inflated by a prompt within the app that asks for a review - if you pick 4-5 stars it posts it within the App Store. If you choose 3 or lower it will not allow you to post it. Avoid if at all possible. I mostly use Epic Haiku. Great for work productivity 24/7. Excellent great help when working from home. Here we are. May 2018. It’s been years, and we still don’t have trackpad style mouse movement like iPad has had forever. Please, make the iPhone receiver usable, and add trackpad support. All I get is this now: The session launch ended; either the session was not visible to the user, or the ICA engine did not load properly. I found another person on their forums with the same issue. They say Citrix has been trying to figure out it for a month but can't. I need Citrix fur work on my Mac, we had to start using a multi-authentication system, ping, at first the web based Citrix was working. Now is days unblock plugin, only there is no plugin to unblock or allow in safari settings. Now how am I supposed to work remotely!!???!!! Did all the troubleshooting with a technician who eventually attributed it to glitch in Citrix programming. 90% of the time i can’t even log in. I just get an error message saying the server isn’t available. When I can log in the entire app freeze and then kicks me out. I love this app and the functionality it provides. Screen redraws seem to be an issue. I will click, looks like nothing happens, but click somewhere else, and the screen will redraw. Only complaint. Otherwise, really awesome! It works pretty well 80% of the time. But that 20% when it stops me from logging in so I can rate the app is enough to lower the rating to 1 Star. If it would allow me to click a star AND then finish my login I’d be OK. I have to start the whole process over again. Product works great. Remaining minor rough spots: - Display does not reformat for smart phone. - Locating updated Certificates for macOS is challenging. Works great on iPad. Works great on macOS and Windows 10. I loved this app and I was giving it a 5 star rating until the last update in January. I work of my Apple iPad and never had a problem with access until now. I'm getting error 183 a handshake error. From what my IT department says it's Citrix that is having this issue with thier apps for Apple products. That apparently Citrix owners know about it and don't even have it on their list to fix. Thanks a lot Citrix! Now I can't work from home!! THIS NEEDS TO BE FIXED!!! After I bought my new iPad Pro I was excited to add Citrix for mobile office us e. Sadly I have been up able to download the app for three days. I receive “Unable to download” whether attempting using LTE or a WiFi connection. I suspect this an Apple Store issue - HELP! I don’t have a IT department I just use the app to run Windows 8.1 on my iPhone but every time I try to do anything on the app it gives me a error that says that i need to enter the info of my IT department please fix the problem! It means I don’t have to take my laptop on vacation and that’s five stars any day. Options for mouse pointers and keyboard input are very precise to me. Not sure what the complaints are about. Maybe old tech can’t handle it but my iPad Pro is butter. I travel and use CITRIX to remote into my laptop from my iPad. Everything I do goes through CITRIX. I rarely have an issue. I work for a company that has an IT department, so they use this app. I don't have a choice. I'm not that tech savvy, but I'm the only one in my department that doesn't use paper. This app allows me to get my census and take a picture of it, edit it pick it up in Notes Writer and make notes on it. It works great. In the past there have been a couple of issues-nobody's perfect. One issue now is that it locks up when I try to remove a patient from the census. So, only four stars. Great app because I can login at home. 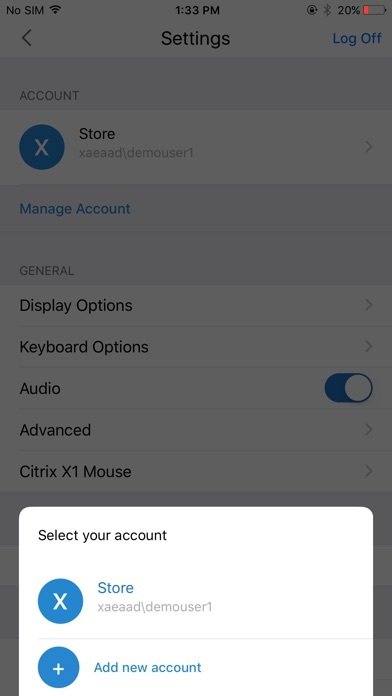 I’ve been using Citrix remote access for a 5 years on my iPad to log on to my work computer and it works great. I highly recommend it. This enables me to do my work conveniently from any spot. On this updated version 7.5.1, my iPad battery drains rapidly. It is directly correlated with this update. Works well on small iPhone screen. I do time card I get paid. How is it not 5 stars? Allows me to connect with work system from my tablet. Using an iPhone SE I can no longer use the app to logon to Citrix. Right after selecting a link, the app force quits. It’s not a site-related problem, as I can access the same links with the app on an iPhone 8 as well as an iPad. The iOS version of this receiver has continued to be as unresponsive as ever. It didn’t matter if I had an old version of iOS or a new iOS; an old 6+ or the X. It’s likely not the fault of this app and they probably have their hands tied, however, it would be great if they found a solution to smart phone/pad responsiveness and functionality. I am floored that I am able to quickly login and do some work remotely on the go. Normally, I need to login with my laptop but with the app, I can quickly login to my Citrix application and complete tasks while away from the office. This is simply amazing! Works great in iPad. Little painful to work on iPhone. It handles the physical keyboard incorrectly at login requiring the app to be restarted repeatedly. Once I login the app closes/crashes. I am able to stay logged in for approximately 5 minutes which prevents me from getting any work done and is extremely frustrating. I can’t get my iPad to log into my work workstation using the full version of Citrix. Only the lite version, which is very difficult to use, allows me to access the computer. If i am on the full version it just won’t connect... is this being fixed? Using Citrix to run Epic EHR for a large health care system. Unable to navigate through patients charts as each screen change leads to disconnection and a black screen. Must delete and reinstall app to open again. Using EPIC with the Citrix receiver had been great for the last 6 months. However, after the most recent iPad software update, EPIC on Citrix has been buggy and continues to freeze in the middle of me putting in orders. I don’t know if the issue is on the Citrix side or the iTunes software side, but it is now a huge issue and greatly impairs my ability to work on the go from inside the hospital or check on my patients outside the hospital. I hope someone on here knows of a fix for this newfound problem. Has been running smoothly without any problem to access Citrix web apps at my hospital. Can’t use app till u give review. Not updates for iPad Pro 11”, and keeps crashing me out of VMs. Not sure if it’s related to not supporting the new iPad resolution or not. Also, frustrating that it doesn’t allow multiple accounts simultaneously. The app is just limited, unstable, and frustrating. I don’t understand what is the point of having a support area in your application if no one ever responds. You click on support and an email pops up with the build number of the application and the phone that you are using but there is no actual email address where you could send this to so you have to try to Google search anything on the web to get any sort of valid email address. You do not get any responses from them at all so what is the point of having support. Ever since you guys updated this application I cannot login and put in my credentials. 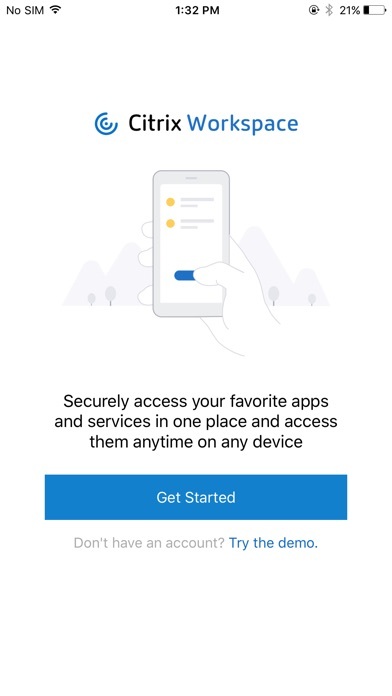 The app tries to automatically log you in, therefore without putting any sort of credentials it gives you invalid credentials of course. I am using an older version of your receiver on another mobile phone and it works perfectly. I have also sent you examples of this and yet I do not get a response. Terrible support. Please fix this app, it does not open my remote access any more. The previous version was completely fine, and now I can’t even log into my accounts. I tried to use this for work but the scree resolution is just too low 1024x738 is what we used 10 years ago. How about offering the ability to change it in setting? So frustrating! This app is slow to launch. Once it finally does launch, it VERY frequently will suddenly shut down due to a bug. It makes it useless for me to chart from home if I can’t pull it up on my device. It seems to be worse, since the last update, although this has often been a problem. Please fix this!! New update doesn’t populate a keyboard for passwords. Cannot enter the site 3 out of 4 tries. My app won’t go in landscape mode on my phone. It’ll take like 20 mins just to do so. Needs an update!! Apps running in Citrix are unreliable and frequently crash. This is especially true for EPIC EMR. I can no longer access my work server. It says credentials invalid but doesn’t let me enter a password or entrust token. Connection issue? Too bad - try again tomorrow. Constantly glitching on my iPad Pro. I will open something inside the workspace and it will just shut down. I then have to go through the whole authentication process with my account and security for work. So sending an email with an attachment from the system could take me 10 minutes, which is entirely too long. If it were more reliable it would be great. I have to use this for work and it’s very frustrating app to try and use. Shuts down constantly. Always has error messages then the screen goes blank. Constantly have to log in and log out just to work from home. The new iPad Pro from fall 2018 supports 5K external displays via USB-C DisplayPort, which works with any app that supports AirPlay. Citrix Workspaces is supposed to support AirPlay, but its support for external displays is buggy. Whenever I try to turn on the app’s external-display mode, the resolution on my external display is way too big, and it gets cropped so that only a corner of the display gets displayed. Keep this in mind if you go buying a new iPad Pro and USB-C display with the intent to use Citrix Receiver with them. I love this app! It allowed me to fully replace all my tech with just one iPad. I love that because they develop this app I can just carry around an 11 inch iPad Pro as an accountant! One suggestion though. I had a Microsoft Arc Mouse that I absolutely loved. Matched my iPad, just as portable, no wires, but I can only use the Citrix mouse in the Citrix app.. Would there be a huge issue in extending compatibility to any Bluetooth mouse instead of just the Citrix one? I mean, we can use any Bluetooth keyboard.. Still 5 stars, would just love to see this implemented soon. Works well for customer history! Easy to use! This app is key for me to do my job—I really have no other choice. When it works it’s amazing. The problem is that it almost never works on the first try. Almost every time I want to login anew, I have to delete the app, hard restart my computer, re-download the app, and pray it works. I just came off a bender where I tried probably 12 times and nothing. Unfortunately I rely on this app for my job so this is incredibly frustrating. I did buy the mouse to go with it, which completely transformed the way I work at home. I highly recommend it. App has not been allowing sprint users to access the app it won’t verify when it worked it was great now I can’t use it at all. This update is an improvement, but when opening the app, the cursor is now at the login name box and not the password box like it used to be, as though the app ‘forgot’ that it has remembered your login name. Minor point, but it is an extra click. With my job at Humana, Citrix is a requirement to log in. After the update to Citrix workspace, I see nothing but constant rainbow circle spinning on my screen. This puts such a delay in my work! I use a MacBook Pro and the system is up to date. When I reached out to my IT dept and advised them, they said it needed to be addressed with you guys. Frankly, it shouldn’t be my place as I’m not the developer of either systems. Please fix! Whenever I register then I sign in to my account, it always says “There are no available apps at this time.” I have tried this about 5 times and the same thing came up. This is tremendously improved over the past 18 months. Good Job. Now can you please put some of the same polish and elements on your Sharefile App. Functions work well. The basics are there. Used to work with my EMR, but after a recent update, I’m unable to log in even after configuring it properly. I wish there was a way to store the credentials like in the desktop version. Doing this so i can open the app. The app mostly works these days. Significantly more bugs since iOS 11. I am a physician and have put up with this app for almost two years. It crashes multiple times a day and I am embarrassed of my iPad Pro because of how poorly Epic runs on it. I’m experiencing issue opening the app. Is down? Well ..can’t give any stars if you can’t get in. Latest version has a bug that prevents the keyboard from displaying on login. Very Stable and user friendly. I highly recommend it. New version does not seem to support Epic. Do not download if you want to have an Epic session last longer than 2 minutes. I use this app in the medical field. The latest update is terrible. The keyboard disappears frequently and it does not connect well at all with the secondary security verification app, Duo. I have to close and open this app multiple times just to get my EMR to open. It delays patient care significantly. The previous version was stable and connect seamlessly with Duo. DO NOT UPDATE TO THIS VERSION! It’s faster than Citrix through my work computer. It’s convenient on my phone but a little harder than an iPad and a lot harder than the computer but fo on the go issues and quick items that need to get handled, I’m so glad there’s a mobile version. I’m not giving five stars because it sometimes takes a while for an app to open and there’s no indication that it’s working. I don’t know if it’s stuck or I’m being impatient. Switching between apps can be clunky at times. Working with an iPad and an Apple pen with a keyboard is the o my way to go. The app is better than previous versions but it seems every time I upgrade phones or app versions. There’s always a new bug. This time it’s pixelation on Auto Fit. Few versions ago Auto Fit didn’t even work. So I guess it’s a stepping progress. Great. Easy to use reliability. This app has allowed me to virtually take my office PC on my facility walks throughout the hospital and saved me many trips from home to office - only because it works near flawlessly. HUGE productivity app for me with little frustrations. Grateful to our IT and Compliance teams for approving and embracing it. No issues reported. Performing as expected. I cannot edit my account or log into my account after the latest up date on iOS 12 and the latest update on this app Then deleted the app and started over. Now it says that there are no virtual apps available when it still works on my other I pad with the older operating g system and the app without the latest update. I NEED THIS FIXED AS I NEED THIS FOR WORK!!!!!! Still won't be able to see the verification questions. Do you really have a qa team? The app continues to close and become unresponsive after working on it. I use my iPad when I travel and need access. I am using iPad Pro iOS 12.1 and it continues to do this over and over. Very frustrating. I have re installed the app, and it still continues to close the app, and say not responding, close or debug after several minutes of work. Needless to say I can’t get anything done. Please help!! The last few versions of Receiver were pretty stable and good. However, I am finding that version 7.5 is somehow chewing through my battery like mad. I previously could work for 8 hours continuously and end up with 30-40% battery, no I completely run out of battery in 5 to 6 hours. The battery menu in Settings lists that receiver used 95% of the battery power over the past 24 hours. I am really hoping they fix this because it is making it very difficult for me to do my job if I have to plug-in frequently to get through my workday. Downloads three quarters of the way then stops. Tried on two devices on Wi-Fi and LTE. Use it everyday. Says unavailable a few times a month but mostly dependable for my daily needs. It’s a basic way of accessing applications. It is a lot slower than VPN into the network and running your application. Not optimized for iPad. Can’t zoom in or out. Address for location changes after account creation. Needs a little work. The app works good. However, since last update, I am unable to zoom into the page in corner. I am unsure how to get it back. I have tried sittings without luck. Any suggestions? I use this all day every day at work. This app is a lifesaver.